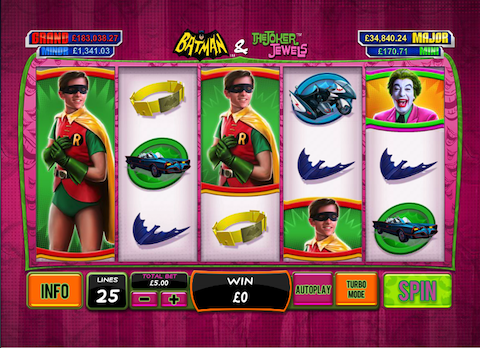 If you're a fan of the caped crusader and want to spin your way back to time when Lycra suits and biffs, baffs and boffs were all the rage, Batman & The Joker Jewels is the slot for you. Developed by Playtech and part of a feature length series of spinners based on the 60's show starring Adam West, Batman & The Joker Jewels offers entertainment from start to finish. Naturally, like all the best slots in the business, prizes make the reels go round. However, what Batman & The Joker Jewels also offers is a ton of fun in between wins. In fact, this online slot is a prime example of how style can influence substance and vice versa. Put simply, if you want to play an online slot where the features are intimately linked to the overall theme, Batman & The Joker Jewels is perfect. Of course, before you scroll through the slots lobby at https://www.sunbets.co.uk/casino/, you'll find the bat-like crime fighter and bank some wins, you need to know the basics. 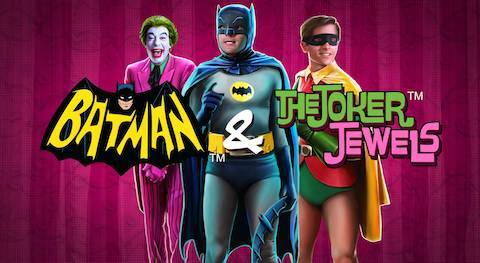 With this in mind, we've compiled a Batman & The Joker Jewels review for you reading pleasure. Starting with the basics before outlining some of the game's defining features, this Batman & The Joker Jewels slot guide should provide the perfect starting point for any slot superhero in the making. Before you can find the Joker and collect his jewels, you'll need to pay the piper. In this instance, that means setting your bets and spinning the five reels and 25 paylines. At the lowest level, you'll be able to pay £0.25 to turn the reels and bank prizes starting worth from 5X your line bet. For those with a bigger bankroll, you can scoop as much as £5,000 (2,500X your line bet) by setting the total bet to the £50 (£2 per line) max stake. Once the reels are in motion, the backing track with music plucked straight from the classic TV show keep you amused as the likes of Batman, Robin, toy guns and, of course, the Joker fly by. Beyond the soundtrack, an autoplay feature allows you to sit back and watch the symbols align while turbo mode brings spins to a stop in the blink of an eye. Beyond the standard payout table that's capable of dispensing wins when you line up three or more symbols, Batman & The Joker Jewels has some special features that give the game a little more street cred. When you take a turn on Batman & The Joker Jewels, the Jester of Jackanapes is always ready to throw some wilds into the mix. As random and unpredictable as the Joker himself, the smiling wilds can appear at any time and help make a winning combination from nothing. With the Joker capable of adding nine wilds to the reels at once, these symbols are fantastic for boosting your potential returns. Moreover, the fact you never know when they're going to strike, adds another layer of excitement to the game. Beyond the random wilds, you can unlock a series of free spins by rolling in three bonus symbols on reels 1, 3 and 5. Once the bonus round kicks into life, you have to choose to play as Batman or the Joker and watch as a potentially unlimited amount of free turns kick into life. As well as free spins, you'll also get access to a multiplier which increases as a metre moves closer to Batman or the Joker. Eventually, once the multiplier metre reaches either character, the bonus round will come to an end and your winnings will be credited to your account. After the game randomly kicks into life, you'll have 20 mystery hexagons to choose from. After clicking on a blank square, it will turn one of four colours. Once you match enough colours to complete a jackpot combination, the round will come to an end and you'll have a prize worth hundreds or hundreds of thousands added to your bankroll. When you take this feature and combine it with some classic looks, generous prizes and slick features, it's easy to see why Batman & The Joker Jewels is one of the top slots at Sun Bets and beyond.